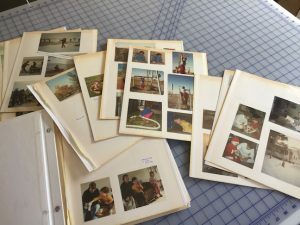 Once upon a time, for about 25 years, in the 70’s and 80’s and early 90’s mostly, I really enjoyed the process of making photo albums. This was an activity that “sparked joy”. The albums have been seen with some regularity over time, and do help to retrieve memories of those years. However, there are some enthusiasm gaps in the taking of photos, and also an under developed system of organizing the photos that I wish to use for artwork inspiration (good composition, usually outdoors, some architectural things, and candid people and pets, usually with good light). Also….. The digital age altered the way photos were taken and shared and stored. I miss having a camera with a view finder that is braced against my face, showing me the artistic choice of cropping that I have made. Taking photos with a phone is very random with glare on the screen and wobbly aiming. Easy to delete the poor ones, however. So I have boxes of negatives/prints and also boxes of CDs/prints, and both are obsolete. Drat. Fast forward to 2019. 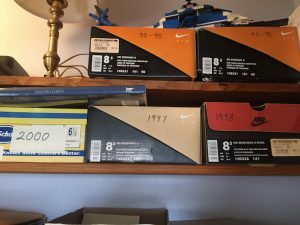 Husband has retired and moved his office space into the room that held those boxes of photos, some of the albums, and plenty of other catch all debris. My “some day I’ll get to that project” has arrived! The big box of Christmas wrapping paper (taking up a lot of realstate) was easy to largely elliminate and move elsewhere. We decided that one Norfolk Pine in the room, would do better than six, and there was no rule saying ” you must care for these trees for the rest of your life”. So, abra kadabra…. out they went. And now, I am knee deep in the overhaul photos project. The earliest old albums are the peel- back -the -plastic- and- stick- photos on -page type. The pages have yellowed along edges and are falling away from the spine. The photos are of surprisingly poor quality (clarity, color, size of people lacking), with most photos stuck like the devil to the adhesive holding it to the page. So I’ve been ruminating on the problem (sometimes when I am supposed to be clearing my mind during meditation practice). 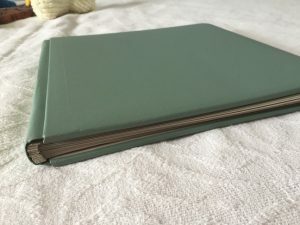 I’ve decided that I don’t like the traditional ways that photo albums are usually done. 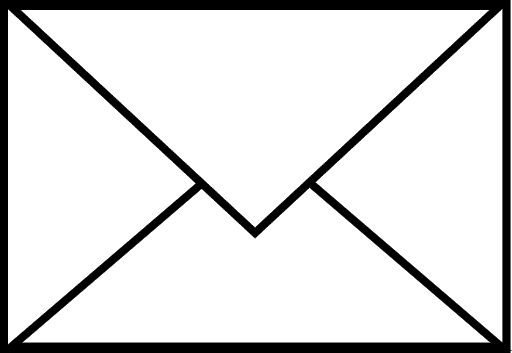 Even in the digital age (send digital files to a printer- book version), photos are usually arranged around special events or family chronology. For a while I thought about saving the favorite (iconic) photos in a (pretty) box in no particular order. 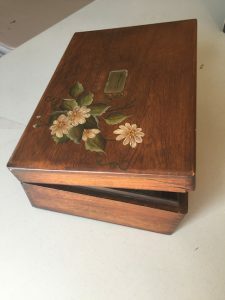 A special wooden box (with a lid) holding a managable number of photos was enjoyed at my in-laws house (in the 90’s), so I have some fond memories of identifying the what-where-who as we poured through the treasure. Very hands on! Which is the very thing I need to get the project going in a fun way. Albums are so wonderful to share, and are a joy to create. Can I get that joyful feeling back? Maybe??? I have ordered new Creative Memories albums. In the meantime, I am going through all of it. Old yucky albums, cardboard boxes, and manila envelopes. I have a plan. It will be shared with you next month. This will keep me honest about getting it done! This recipe was created by Addison Osta Smith, who won MasterChef Junior. Recipe for Lemon Pea Pesto: In a food processor or blender combine 2 c. frozen peas(thawed),1/2 c. olive oil, 3 T. lemon juice, 1 T. lemon zest, and 1 clove of minced garlic. Process until smooth. Transfer to bowl and add 1 c. grated Parmesan cheese, salt and pepper to taste. This can be served with pasta or rice or quinoa. Enjoy.